>Great Lent is a time of repentance and spiritual struggle. Usually that struggle, for me, comes mainly from my own sinful fleshly passions, and I’ve got plenty to contend with. Saint Ephraim the Syrian nails a few of them, and teaches us to ask God to “take from me the spirit of sloth, meddling, lust for power and idle talk.” As we said this prayer and did prostrations with it during the Liturgy of the Presanctified Gifts at Saint John last night, I found myself strengthened, but my mind also wandered to troubling thoughts. This Lent brings additional difficulties, not only from my own sinfulness, but from some recent struggles within my Church—not my local parish, but the Antiochian Archdiocese at large. A heavy sadness fell over me when our pastor recently read this letter from Metropolitan PHLIIP concerning the decisions made by the Holy Synod of Antioch on February 24. The Prayer of Saint Ephraim of Syria also says, “Lord, grant me to see my own sins and not to judge my brother.” This post is not written in a spirit of judgment, but as a call to prayer, especially to my fellow Orthodox Christians. 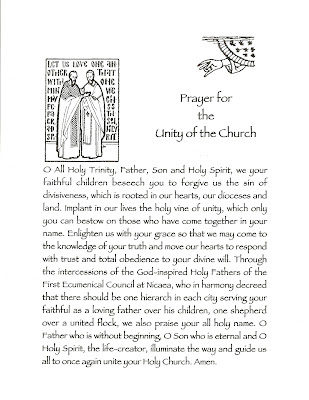 I feel helpless in light of these struggles on the archdiocese level, but I have found comfort in the following prayer, which Father Nicholas, our Assistant Pastor, shared with us a few weeks ago during one of his Wednesday night teachings. I’ve been trying to include the prayer in my daily morning or evening prayers. Please join me, and forgive me, a sinner.